4 stars to this wonderful retelling of The Ramayana and exploration of the nature of love. – While Sita’s character and observations on love seem a bit too naive and emotional in the beginning, she visibly grows up as the book progresses. She still talks about love in the end, but it is very clearly a more polished view on the matter now, after the many challenges life has thrown at her. It includes the thorny side of love too, the dark and negative side of it. – Ravan was probably my favourite character. Divakaruni did not turn him into a hero (that would be too predictable), but kept all of his complexities intact, making him an extremely mysterious character. Another interesting factor was Sita’s sympathy towards Surpanakha, and the unease she feels towards her husband and brother-in-law’s behaviour towards this woman. – Some parts of the novel were a little preach-y, I guess? – I cannot help but compare this novel to Palace of Illusions, which I had rated 5 stars. I do understand thought that it is easier to write a more complex and nuanced novel with Mahabharata (which is itself more nuanced) than to write one with Ramayana (which is comparatively straight-forward). Despite its minor flaws, I would recommend this book to anyone who is interested in retellings of Indian epics. The novel is intense and well-constructed, and the ending is absolutely glorious. A reader or a writer? When I first created this blog (at the very dramatic age of fifteen), I wanted to post my observations related to things I read. I made song playlists for books, mainly. I also followed a lot of book-review blogs, and participated in the book tags that go around such communities. It was, overall, a space for the reader in me to post my views on everything related books. A few posts later, I began to write. I posted short stories and poems that my teenage self was pretty proud of despite the obvious insecurities. I also posted “quotes” everyday from books and songs, and even went on to make occasional personal updates. I have never been able to write very elegant prose or enchanting poetry, but I like to write, nevertheless. I named this space Thunderstorms and Sunshine because it was where I addressed all sorts of things, the sunshine as well as the rain. This didn’t last long. My insecurities drowned my pride, and college engulfed all of my spare time, turning my quite dynamic blog into one where I post book reviews and only book reviews. This is my last semester in college as an English major. Throughout my undergrad course, I have been haunted by the loss of the writer in me. I have never been one to write elegant prose or enchanting poetry, but I have always loved to write, for as long as I remember. For the last three years, however, I have been only reading. I read for college, I read for reviewing, I read in my spare time. I have read everything from classics to cheesy YA novels, from Beowulf to A Court of Thorns and Roses, and I have loved every second. This semester, however, we have a professor who discusses non-fictional personal essays with us, and makes us write our own ones. It’s an odd feeling, to use the first person pronoun in a writing for class, to incorporate my own feelings into a piece of writing without worrying about quotes and citations and thematic concerns. It brought forward a matter that has been disturbing me for the past few years – the conflict between my reader-self and my writer-self. There is no reason why these two selves cannot co-exist harmoniously, and yet I haven’t been able to make them do so for a long while now, if ever. Blogging is perhaps a dying medium, and this blog of mine is surely a dying one. It is entirely possible that I won’t post anything beyond book reviews here for the next 5 years. Perhaps I am meant to be more of a reader, after all. There is, however, a part of me that has more things to say. Things beyond my thoughts on someone else’s work. We’ll see. I am so glad I read this series. The thing is, I get why people may not like this duology. It might seem kind of slow, and I get that not everyone will like these characters. For me, however, these books were a conglomeration of all of my favourite things. – The setting. Montenegro??? Eastern European mountains???? – The characters, especially Iris. Iris is not a likable person, but she was very realistic and not a Mary-Sue at all. She is confused and quite mean and I could understand her at a spiritual level. I also loved how amazing Malina’s character turned out to be in this book. None of them go through any particularly revealing epiphany about themselves, nor do they change a great deal, but they grow stronger with every tragedy life throws at them. – The magic. I like how it began as something very frivolous, something only capable of generating beauty, but ended up having the potential to save the world. – The romance(s). I kept comparing this duology to the Shadow and Bone series (The Grisha Trilogy), mainly because of the romance arc. Fjolar made me feel almost everything the Darkling did, and whatever he lacked was made up for Luka. I had hated Mal in Shadow and Bone, but Luka made me laugh and cry and hurt. Plus, you have Niko and Malina, perfect together and complete cinnamon rolls. – The writing. Lots of reviewers have criticised the author for her “purple prose”, but I found the language just perfect. It was not overtly flower-y and poetic to the point where it lost meaning (*cough*The Star-Touched Queen*cough*). It had better language than the usual simplistic or at times cliche YA novels. *I* didn’t dislike ANYTHING. But, once again, I get that it is possible to find this book slow, and if you do not like the characters, you possibly may not like the story. I’d say this book has a very specific kind of target audience. If you like a sort of witchy, dark vibe to fantasy novels where the characters may not be always likeable, and if you like descriptive writing and beautiful settings, read this book. As a biased fan I would say that even if you aren’t sure you like these things, just give this series a go. I’ll go buy the hardcover for the first book, practice wiccan rituals, and move to Montenegro now, thank you. I am not exactly sure what to say about this book. It affected me in multiple ways all at once. To begin with, after reading the blurb, I would honestly consider the story to be ‘unrealistic’ if it wasn’t actually based on a real story. Putting the words ‘Holocaust fiction’ and ‘hopeful’ in the same sentence feels weird to me. Not that it was all rainbows and butterflies- the book made me angry and made me cry, but inspite of it all, the over all narrative is necessarily that of survival and hope. The story begins off a little… tentatively, for the lack of a better word, but things got quite horrifying at around half way into the book. I haven’t read many WWII-related books that are actually set within a concentration camp and shows the inner workings of such a place, and I get why it would be controversial to do so. Perhaps the most interesting thing in this book, however, was the way Morris portrays the characters. Lale’s determination to live and Gita’s courage is undeniably inspiring to read about, but I especially like how even the other characters are all very well defined. What makes the book more convincing as a narration of a true story is perhaps its depiction of morally grey characters. Both Lale and the reader search for even a speck of humanity within this harsh world with bated breath. The language of the book is very simple and almost matter of fact. Personally, this was one of my problems with The Tattooist of Auschwitz, but it is also the reason why I can recommend this book to a wider audience. I’m sorry this review is so all over the place and not organized enough, but this book raised some complicated thoughts that I can’t seem to arrange more coherently. It blurs the line between fiction and non-fiction, and I can’t judge it with the usual features of either of the genres. Overall, I would recommend this book to anyone who is interested in reading Holocaust fiction (or non-fiction? ), and to those who are willing to read a moving book set in a terrifying reality but ends up, unexpectedly, being a love story. Thank you HarperCollins India for a copy of this book. I started this book yesterday, then woke up at 4 a.m. today to finish it. I don’t know why, but I was a little scared to pick this book up. I had already delayed reading it because of several other preoccupations in the last few months, and I planned to read it this winter for sure. But when I finally opened the book, I felt like I might not like it. I have LOVED all of M.C. Frank’s books, and it was possibly the high expectations that felt intimidating to me as a reader. I am also not much of a fan of YA novels, but made an exception for M.C. Frank’s lovely writing. Salt for Air did not disappoint. – The plot and the world-building was great. I am obsessed with fairy-tale retellings of all sorts, and this one was perfect. – One thing I love about M.C. Frank’s books is how intense the stories are. The characters are brimming with all sorts of emotions and I love reading about them trying to figure it all out. I like my romance novels a bit angsty, and Frank’s books have all the angst I need. – I adore the setting of this book and how the author deals with it. Ellie keeps comparing American contemporary YA fiction to her own life, and her tone is very similar to what I, as an Indian, think every time I read one of those books. Although Greece and India are very different countries, they both carry a rich cultural heritage and an ancient history. It was very easy for me to relate to Ellie in that sense. 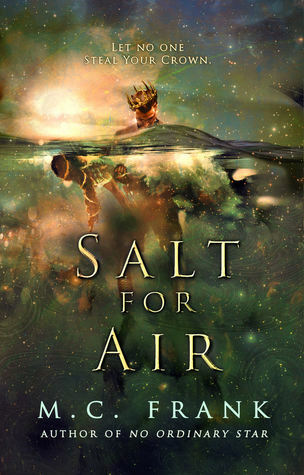 If you like your YA books to be set in places other than a small town in North America, Salt for Air is a great choice. – The characters and the settings are really vibrant and real. Although half of them were mythological creatures come to life, they were still very humane, despite their attempts to act like they weren’t. – I think the narrative focused on Ellie a lot, and sometimes too much. I would have liked to know more about Ky especially – his feelings, his motivations – not to mention about the realm that he is supposed to be king of. I am keeping my fingers crossed for a sequel, because I really think this book has potential for a continuation. I am so, so happy with this book and its characters. Whatever flaws I thought it had also has the potential of being erased with a sequel. If you are a fan of Cassandra Clare’s world-building or Roshani Chokshi’s mythology-based fantasies, this is a great YA read for you. This was the first self-help book I have read, and while I did enjoy reading it to a point, it was not applicable to me and I did find some things I would consider as flaws. 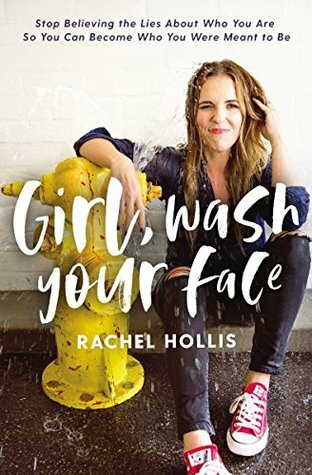 I had no idea who Rachel Hollis was when I went into the book, so my views are, in that respect, unbiased. – The book seemed to be aimed at a very white, affluent, Christian audience. I am in no way suggesting that Hollis’ tragedies were any less real than anyone else’s, but there are several incidents she mentions that, for the lack of a better term, I must categorize as “first-world problems”. For instance, she talks about seeking professional advice regarding mental health, but that is an essentially unhelpful advice for most of the world, which does not access to such benefits. – The language. She keeps using terms like “girl” and adopted a conversational style, which felt a little forced to me. It would work for a blog post, but in the 200+ pages of that book, those terms were too repetitive and the style too cringey. – I am not sure if this is a flaw per se, but the book just was not exceptionally impactful for me. Perhaps I expected too much, but I felt disappointed. Or perhaps self-help books are not for me, as I have always guessed. – Rachel Hollis has courage. You might call it an attention-seeking move, a publicity stunt, or whatever you wish, but the level of intimacy she shares with her readers is praise-worthy. No matter how famous and successful you are, no matter how much your life is subject to societal scrutiny, it takes a lot of bravery to reveal the amount of things Hollis has in her book. It wasn’t necessary for her to be this personal in a self-help book, but the fact that she was, enriches this book a lot. – The structure of this book is really nice. It is divided into short sections with appropriate chapter headers which helps you choose any chapter randomly and start reading. I personally did not feel the need to read serially, and even skipped one or two chapters that I was sure were not applicable to me at this point of my life. – This book is Rachel Hollis’ personal mantra of success. She structures her advice as “things that helped me”, suggesting that these were the things that helped HER, and she is sharing it to readers in hope that they might find them useful too. It instantly makes her sound less preach-y, and helps you understand where she is coming from. Personally this book did not strike a chord with me. However, I do think it is an interesting read for fans of Hollis and anybody who is curious enough to know what worked for one particular successful woman. It is honest, if not anything else, and I would say that alone makes it worth a read for those who are interested in the genre. A great read for children – sweet, quick and enjoyable. I loved the characters and I loved the overall feminist vibe. Set in Victorian England, the story appears to be quite true to its background. As an older reader, I did find it it a little lacking in character building. However, I would definitely recommend this to younger readers (around the age of 9-10 years according to me); it is one of those books that you can recommend with your eyes closed. This particular edition from Usborne is a reprint, and I like how colourful and attractive the new cover looks. Thank you UsborneYA for the review copy.